This is the newest kids petrol powered quad bike to hit the market. The quad has been given a sporty new look with a new all in one strong shell finished in black and green to match the frame. It also features a cool new exhaust system and upgraded bigger 6 inch diameter wheels with matching green rims. The small 49cc engine with automatic gearbox pushes the quad to speeds of up to 25mph so adult supervision is advised. The engine is 2 stroke meaning it runs on a mix of normal unleaded petrol with 2 stroke oil which is available at all petrol stations. A mixer is included to ensure the petrol to oil mixture is correct. Recommended for ages 4+. Maximum height 5ft. Maximum weight 90kg. The quad has been given a sporty new look with a new all in one strong shell finished in black and green to match the frame. It features a cool new exhaust system and upgraded bigger 6 inch diameter wheels with matching green rims. The small 49cc engine with automatic gearbox pushes the quad to speeds of up to 15mph so adult supervision is needed. The engine is 2 stroke meaning it runs on a mix of normal unleaded petrol with 2 stroke oil which is available at all petrol stations. A mixer is included to ensure the petrol to oil mixture is correct. Maximum height 5ft. Maximum weight 90kg. Included with fuel mixing bottle. Very simple throttle system, just push the lever to go. 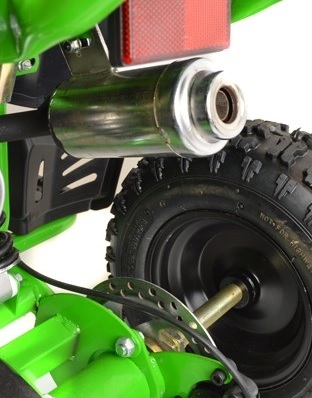 The throttle adjustment screw acts as a throttle stop and can be adjusted to limit the speed. Parental Discretion. Ages 6+ with adult supervision at all times. Maximum height 5ft. Maximum weight 90kg. Hi will you be getting this back in stock at special offer price? And do you have any other special offers on 50cc quads? Hello - thank you for your question. I can confirm we are expecting stock of this quad again very soon however unfortunately we cannot give you a specific date at this time. In regards to special offers, unfortunately I cannot confirm the sale will be still running as we do not have a date for this as of yet. Does it have a button to start or is it a pull ? Hello - Thank you for your question. This quad has a pull start. I hope this helps you! How do your loyalty points work? Hi, Thank you for your question. Loyalty points are designed to be accumulated over multiple purchase and then used against a future order to receive a discount. the reommended age of this ATV is 6+. Maximum height 5ft. Maximum weight 55kg. Hi is this ready asembled? If not, is there anyway it can be? Hi, this is partially assembled as we are unable to transport it fully assembled. Hi has quad got electric or pull start? What is the lowest speed that this can be restricted to? Hi, Thank you for your question. This has a throttle adjustment screw. The more this is adjusted the slower the quad bike will go.